The farmers markets here in the Portland area are probably at their most abundant right now. Tomatoes, peppers, corn, and eggplants are still bountiful and colorful. But trying to crowd them out are the piles of winter squash, apples, pears, brussels sprouts and the rest of the fall contingent. The weather is leaning towards fall but I’m a die-hard summer veggie eater as long as I possibly can be. I know those hefty squash that have absorbed a season’s worth of warmth and turned it into an edible hunk of sunshine will be there for me in a few weeks and will stick around until early spring, not much worse for wear. 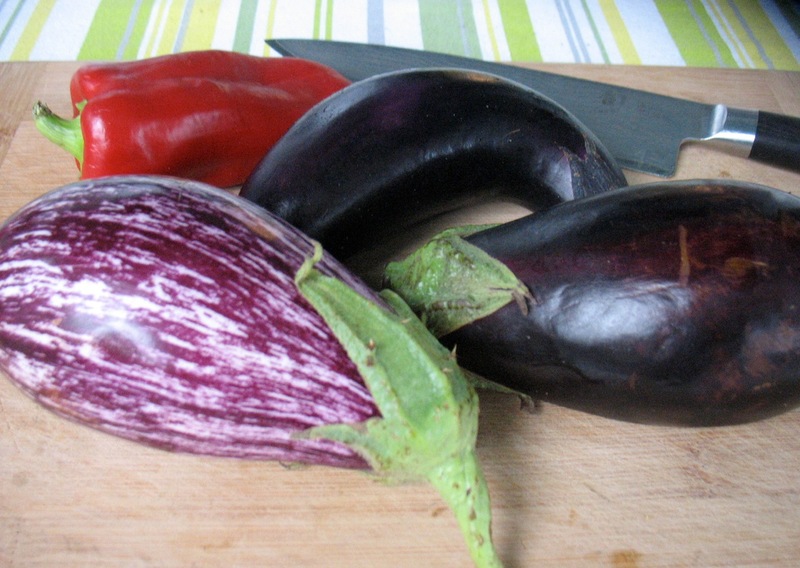 Eggplants and a sweet, red pepper needed for the Hot, Sweet, Sour Eggplant dish below. But the summer veggies are more fleeting so I’m cooking with eggplant and peppers almost every day and madly preserving tomatoes along the way. I tend to make Italian dishes with these but lately I’ve been having fun with a Chinese-inspired dish–Sweet, Hot, Sour Eggplant–named so by me and undoubtedly inauthentic. It’s quick, full flavored and richer tasting than it is. The Thai basil that’s still thriving in a pot in my backyard makes it extra good but more common Genovese basil, cilantro or even parsley would all be good. I neglected to take a picture on the evening I made this so this photo is of the leftovers I heated up together with the rice for lunch the next day. 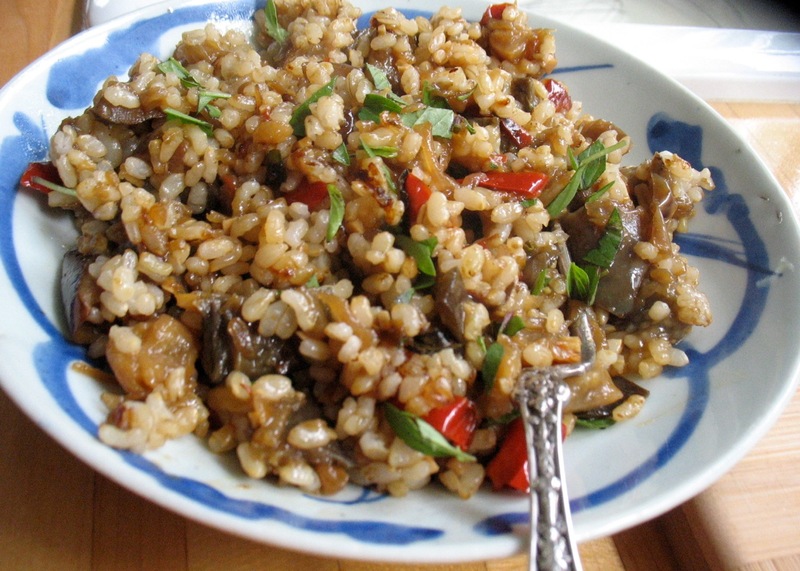 My favorite way to serve this quick Chinese-inspired dish is over short grain brown rice but any rice is excellent. It’s a rich-tasting dish though actually fairly light in preparation. Stir together soy sauce, vinegar, sugar and cornstarch in a small bowel. In a large skillet or wok heat the oil and sauté onions and pepper (if using) over medium-high heat for about 5-7 minutes until they soften. Add red pepper flakes (or minced hot pepper) and eggplant and cook until it softens and browns a bit, about 15 minutes, stirring frequently. A few minutes before the eggplant is done add the minced garlic and stir well. Then add the sauce and stir well to mix and coat veggies. Cook over medium heat for a few minutes until sauce thickens and veggies are tender. Stir in the herbs, saving out a few for garnish if you’d like. Serve hot over rice with reserved herbs.